So, how much do you want to know? I grew up in New Baltimore, NY. A small community south of Albany, our only real “claim to fame” is that we had a rest stop on the NY Thruway. While in high school the church I was attending led a number of short term missions trips. I joined with them in going to minister on the island of Roatan, just off the coast of Honduras. It was there that I felt God’s call upon my life to go into full-time ministry. After graduating from Ravena Coeymans Selkirk high school I went on the Messiah College. While there I earned a B.A. degree in Christian Education and met my wife Nancy. Of the two events meeting Nancy was by far the most significant. Together we have partnered in life and ministry since we were married in 1990. She is a wonderful wife, mother, elementary education teacher, daycare director, published writer and a gifted speaker. From Harrisburg, PA we moved to South Hamilton MA where I attended Gordon – Conwell Theological Seminary. I took the long road, thanks to Hebrew, and graduated in 1995 with an MDiv. degree with a concentration in youth ministry. In June of 1995 our family expanded as our son was born. We were called to Memorial Baptist Church in Cortland, NY where I served as the Associate Pastor for four years. My focus was on the area of youth and college ministry but I enjoyed being able to explore many different opportunities for ministry. In August of 1999 we were blessed with birth of our daughter. In February 2008 Nancy and I stepped out in what has been the boldest step in our pursuit of living in radical obedience to God’s call upon our lives and transitioned to life in Locust, North Carolina. We had no jobs, no home…nothing but a clear sense that God was inviting us out of full time pastoral ministry for a season and was inviting us to live in NC. We were clear that God’s invitation back into full time pastoral ministry would be just as clear as the invitation to step aside and we learned to be content and patient with where God had us. I worked for Corning Inc. and Nancy worked in the Stanly Co. school system. Joseph and Rayann made their way through jr. high and high school. In early 2013 Nancy and I both sensed that God was beginning to open doors of opportunity for us again and we started to search His leading guiding and directing regarding possible ministry locations. 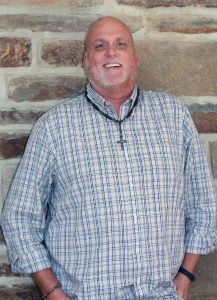 In May of 2014 I accepted a call to serve as pastor of First Baptist Church Kennett Square. Two years into my ministry at First Baptist we began a journey not of our choosing. In May of 2016 I was diagnosed with stage IV colon cancer. Sitting in the hospital bed I heard my oncologist say it was time to go home and get my affairs in order. The prognosis was not great. If everything went well I could hope to live for two more years. Needless to say our worlds were turned upside down. Nancy and I talk about life slowing down and speeding up all at the same time. My body has responded very well to the treatments and we no longer speak about life in such dire terms. My oncologist and I do have conversations about quality and quantity of life. We make decisions that will extend both. My cancer is still alive and well in my liver. While it is smaller than ever before, those cells still exist and I live with the constant understanding that they may cause my health to change significantly at any moment. My prayer is that as I share a little of our journey you will hear the voice of God inviting you to a radical obedience which leads to “life to the full”.